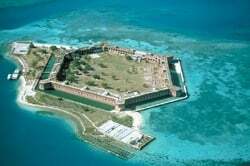 Dry Tortugas is a small, remote island located 70 miles West of Key West, Florida. The Dry Tortugas islands and surrounding waters is the Nation’s most remote National Park. It is a long run trip but the sites, the fish and Fort make it all worthwhile. The fishing is very productive, just as it was 60 years ago and there have been many IGFA World Records caught near the Dry Tortugas. Currently, I believe the area boasts over 300 world records, maybe you’re next. The Garden Key at the Dry Tortugas houses a pre Civil War era fort, part of which now doubles as a park ranger station. The fort itself will amaze you, to think clear back in the 1700's 14 million bricks were hauled all that way to build what was one of the largest manmade structures built at the time. Both island chains are surrounded by shallow and deep water reefs and wrecks, and are a true angler’s paradise. Because of the distance to the area from Key West, these reefs and wrecks receive very little fishing pressure. A typical trip might include your limit of grouper (black, red, and gag). Also, limit of all kinds of snapper; yellowtail snapper, red snapper, mutton snapper, mangrove snapper, and cubera snapper are a common catch. Of course king mackerel, cobia, permit, and goliath grouper are all over the wrecks, Offshore in the blue water species like, tuna, wahoo, mahi mahi, sailfish and other pelagics can be caught live baiting. It is one of my favorite places to fish but it takes a good weather day and a commitment to a 12 hour fishing day and fuel surcharge that is expensive.